Can be eaten alone as a snack, with rice, broken up in a wrap. Preheat oven to 375 degrees. Spray muffin pan or cookie sheet with canola or olive oil. Mix all your ingredients together in one large bowl. 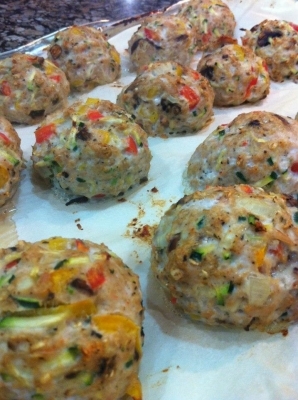 Roll the mixture into balls and place in muffin pan. Bake for 35 minutes. Makes 18 muffins.